Stunning 10" matte enamel Boch Freres Keramis vase, D2784, F945, 1941. Signed by Jean Verheyelwegen, our vase is in excellent condition. Very rare Boch Freres Keramis 12.25" high gloss enamel vase, D907, F974, 1924. In excellent condition. Charming 7.2" Gres Keramis bottle vase, D 880, F905, circa 1924. In excellent condition. Very rare Boch Freres Keramis 11.5" vase designed by Jan Wind, D1637, F895, circa 1932. In excellent condition. Rare 11" Boch Freres Keramis vase, D1580, F897, circa 1932. Unlike it's more vivacious cousins made by BFK during the art deco era, this lovely vase is quite Japanese in feel and is in excellent condition. Rare 13.5" matte enamel vase with squirrels by Boch Freres Keramis, D 1349, F723, circa 1930s and signed by Charles Catteau and Delfant. In superb condition. Fabulous 10" vase designed by Charles Catteau for Boch Freres Keramis, D1366, F901, 1924. In excellent condition. 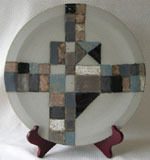 Magnificent 11 3/4" stoneware plate by master potter Bruno Gambone. Born in Salerno, Italy in 1936, Bruno Gambone spent much of the 1960s in New York. In excellent condition.